This sign not far from the entrance to Whidbey Island Navel Air Station. Image taken in mid 1990s. I don't think sign is still there. 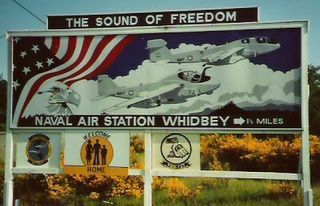 An irony that military jets are seen at the "sound of freedom." Doesn't the military mean regimentation? I bet they mean "regimentation, for a while is the price of freedom." I have camped at Deception Pass State Park, not far from this sign. One hears jet engines most of the night. Kind of interesting to watch, by day, but hard to sleep.